There is a great German word that does not have an English translation as descriptive as it should: Schweinehund quite literally means "pig dog". Schweinehund gets used in phrases like "Ich muss meinen inneren Schweinehund überwinden," which translates to: "I need to overcome my weaker self." We all know that feeling when you want to do something like go for a run, file your taxes or tidy your flat. But there are many reasons not to get started: it is raining, you are still waiting on a document, or Netflix keeps showing further episodes. In the past few years, I have had a bit of an innere Schweinehund with skiing. Getting up early. Getting my gear together. Lugging it all to the train station. Struggling to find a seat. Not having anywhere to put my stuff nicely. Transferring from the train to the bus and hoping that I have everything with me. I might be exaggerating to some degree, but let's be honest: there should be a better way that does not require me to drive in my own car or spend a night in a hotel by the slopes. I have good news: there is a better way. It is the Eurobus Skiexpress that will take you from a central pick-up spot in the city directly to Arosa-Lenzerheide. I have tried it out, and here is my review. A warning: you will still need to get up early! But once you reach the bus terminal, it is smooth sailing from there. In Zürich, the meeting point is right by the Hardbrücke train station. The seats on the bus are comfortable, and there is coffee, beverages and free WiFi on the bus. Your skiing gear disappears in the luggage compartment of the bus. No need to try and force it into a rack that is too small - or have it fall over. The best part is that the bus brings you directly to the lift with no additional transfers. On a February weekend, Ich habe meinen inneren Schweinehund besiegt and I take the Eurobus Skiexpress straight to Arosa-Lenzerheide. The bus driver welcomes everyone at the station, helping us load our gear. Then we hit the road and I use the 1.5 hour journey to catch up on some sleep. Optionally, you could get off in Churwalden, a ski arena with morning sun which is connected to Lenzerheide (which is sunny in the afternoon). Got no skis of your own? No problem. 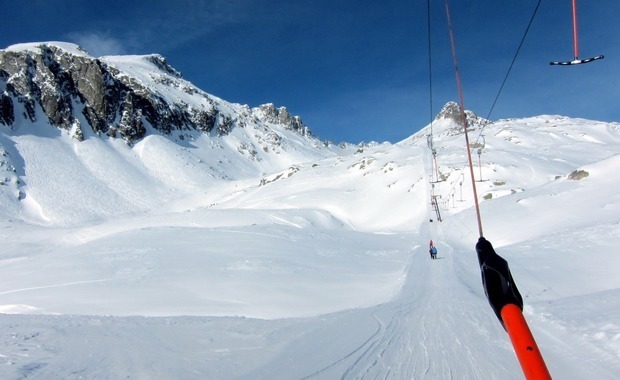 The lift facilities in Lenzerheide have recently been updated and are comfortable to use. With a wide range of blue, red and black pistes, there is skiing for everyone. The mountains offer a resource which we are often lacking in the cities during those foggy winter months: sunlight. Once you have spent your day producing vitamin D, getting back home is a breeze. This is the time of day when other snow enthusiasts need to treck back to their cars or make the long trip home with transfers. Do you know that feeling when you are hauling your ski gear and a freezing cold drop of melted snow hits the back of your neck and travels down your back, causing you to shiver?